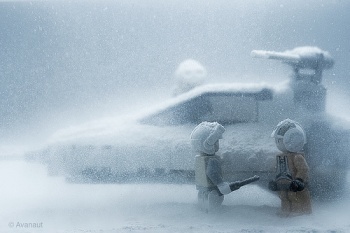 A Lego and Star Wars afficendo got all inventive to take some amazing images of the wintery planet of Hoth. Check out the picture on the right, pretty awesome, yes? It shows a rebel pilot arguing with a tech about getting his Y-Wing to fly in the frozen wastes of Hoth. The picture is so detailed, you can see individual snowflakes falling from the sky. But how was this image done? If your first thought was 'Photoshop' you'd be wonderfully incorrect, because this image is largely free from digital trickery. Created by Finnish photographer Avanaut, the scene is actually underwater in a transparent tank, which allows the scene to be photographed without needing a high shutter speed. Hidden beneath the layer of snow is a grey baseplate that the model and minifigs are attached to to prevent them floating. It's worth checking out the rest of Avanaut's flickr stream because he's got plenty of very cool images for you to peruse.